An unknown travel-writer makes this report of his stay at The Portland Arms, taken from The Penny Magazine [Vol.VII, Issue 377, 17 February 1838], "Here I met with comfortable quarters and considerate attention. The ‘Portland Arms’ is not a wayside house, where travellers are coming and going every hour, and where, therefore, you have no right to expect more than prompt but general civility. It is rather one of those retired country inns, where visitors are treated with a homely but warm-hearted attention, which places them almost on the footing of friends. And though the inn cannot boast of being as fine as a London hotel, it has, nevertheless, its reputation. George III, during his visits to Weymouth, had several times made a tour of the Isle of Portland; and on those occasions he made the ‘Portland Arms’ his head-quarters, and used to finish his day by dining at the house. The then landlady had a recipe for making a certain famous Portland pudding, and the King never failed to order this pudding, in honour of the island. 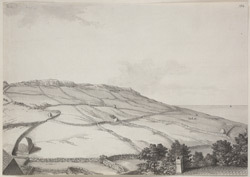 She bequeathed the recipe to her daughter, the present landlady; and though the pudding may now be ordered by the humblest visitor, the honour of the king's visits is still felt in the ‘Portland Arms’ with something of that satisfaction which another royal visit left in the Castle of Tillietudlem".